Welcome to the Creationism vs Science page! 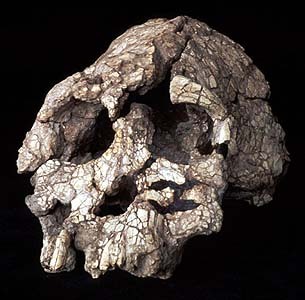 To your right, you will see an image of a 3.5 million year old skull excavated from Kenya in 1999. This one is named Kenyanthropus platyops, and it is being proposed as another possible distant ancestor of mankind. Its features are somewhat different than those of "Lucy", also known as Australopithecus afarensis (discovered in Ethiopia in 1974), with smaller teeth and a flatter face. It is also possible that it is related to the australopithecus family, and that its initial classification as a separate genus may have been premature. Researchers are hopeful that more such remains may be found as excavations continue. This specimen is being added to the growing list of species which existed 2 to 3.5 million years ago and are clearly neither modern primate or modern human, one of which may have been our ancestors. However, creationists reject all of this. According to creationism, humans sprouted fully-formed in our current state, as did all animal "kinds" (a term which creationists use instead of "species", but which is curiously undefined). In an attempt to co-opt the language of science (if not its methods), they even call it "Creation Theory", even though a scientific theory should allow one to derive specific predictions from a defined mechanism: something which is impossible for "Creation Theory". Of course, none of this is a problem for creationism because it is not (despite its claims to the contrary) a scientific movement. It is a religiously motivated political movement, which is why they publish all of their "research" directly to the general public rather than letting other scientists subject it to peer review. Unfortunately, there are many kinds of arguments which are far more convincing to someone who struggled with grade 11 chemistry than someone who actually studied science at the university level, which is why creationism enjoys more than 50% support from the American public while languishing at less than 1% among scientists.